Magic has the following advantages that make it much better than the other vehicles in its class as far as starting issue in rains is concerned. A bigger 12.5* Kg cylinder that’s double the capacity offered by the competition. Which means, lesser trips to the CNG fuel station and more time for business. 275 SI CNG ‘best in its class’ multi point gas injection engine for improved power, faster pickup and better fuel efficiency. Best in its class in power & torque for climbing the slopes easily. Stainless steel piping system and other safety features ensure absolute safety. 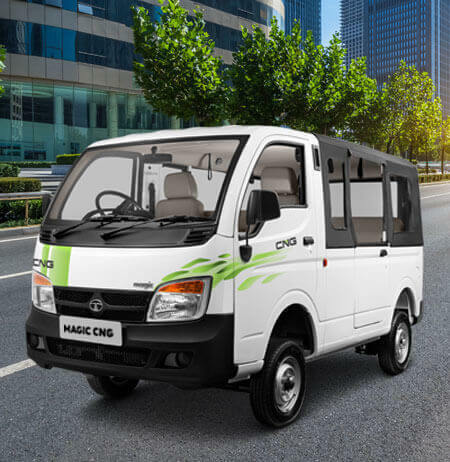 Wide cushioned seats, Ample leg room and headroom ensure a comfortable ride for the passengers. Also there are options available in seating arrangements. The cylinder is placed behind the seats in the rear-hence easy to access and service.